This is a quick look at what is IFTA and what the truck driver must be aware of and what are the responsibilities that the truck driver has under IFTA regulations. Sky Transport Solutions provides IFTA services and support but we want you to be knowledgeable about IFTA. Truckers can get help with their IFTA fuel tax here at Sky Transport Solutions. Sky Transport Solution’s staff provides an app/software and live person 24/7 support, to give you as the trucker a piece of mind that all is OK; we got you covered. When you get your IFTA stickers you will be ready to start tracking your IFTA miles and fuel on your trip sheet. Sky Transport Solutions will make your ifta quarterly fuel tax report easier than ever before, we have been providing quality IFTA and IRP support to thousands of truckers over the years. 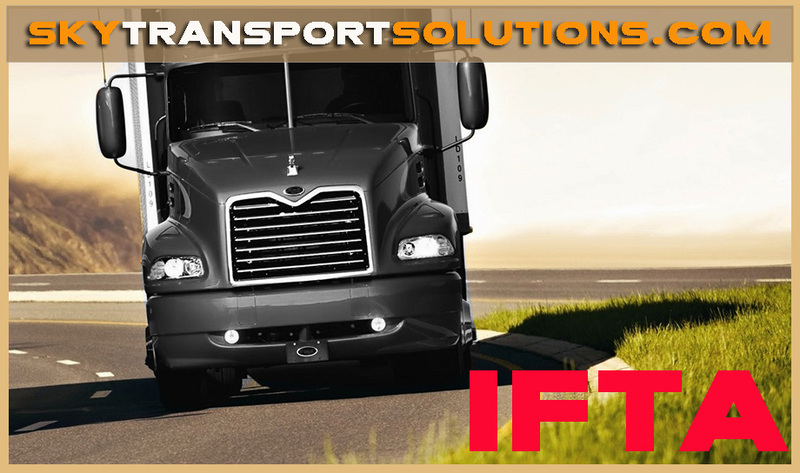 Now that you have your ifta registration, you have to keep your miles and fuel paperwork in order. Ask us when you need to know IFTA tax rates, we will let you know the correct tax rates for all states. Did you know the organization responsible for IFTA is called IFTA Inc.
We have IFTA fuel and miles PDF forms ready for you to download and print at your own convenience. Trucking is an important part of the economy and that is why there are so many regulations regarding trucking. Shipping freight is one of the most crucial aspects of todays economy, and that is why it is so regulated. So lets get started on your questions. Who is required to have IRP and IFTA? An IRP and IFTA account is required for trucking companies that have vehicles crossing state lines that are over 26,000 pounds gross vehicle weight or have 3 or more axles on the power unit. I already have an IRP account what do I do next? Next all you need to do at this point is set up IFTA. Why can’t I get my credentials immediately? All requirements must be met before credentials are issued. There may also be some jurisdictional delays, so check with your base jurisdiction. A base jurisdiction is the state you select to be your base jurisdiction, there are certain requirements see below. What are the base jurisdiction requirements? Answer Base jurisdiction is where the motor carrier has an established placed of business and owns, leases or rents a physical structure that is designated by a street name or road. Jurisdictions require proof of this. The applicant can submit various documents as proof, including utility bills in company or a person’s name; state government provided documents showing corporate residency; weapons permit (US only); bank statements, driver’s license, titles, tax returns showing home jurisdiction address; health care card (Canada only).